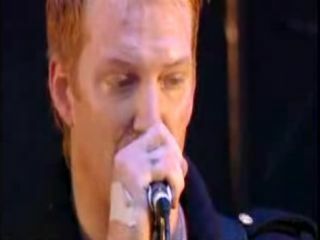 Queen Of The Stone Rage: Josh Homme gets angry with a fan. If you haven't seen it yet, you really should check out the YouTube clip of Queens Of The Stone Age singer Josh Homme bottling a fan during a recent festival appearance in Norway. It's about as shocking as it sounds, with Homme also directing a volley of verbal abuse at the young chap who he suspects has thrown something at him. While you might feel that the singer overreacted slightly, he's certainly not the first star in rock's firmament to put the hurt on someone. Here, MusicRadar documents the relationship between musicians and extreme violence. Jon Bon Jovi may have boasted that he walked the streets with "a loaded six-string" on his back, but we're pretty sure that his guitar never caused anyone as much pain as Keef's did here. Witness the Rolling Stones man taking down a stage-invading fan, scything through balloons like an over-excited toddler at a birthday party. Mick Jagger should have received similar treatment for wearing that cape. Chris Martin is the rock star that you'd happily take home to your mum's for tea, so it came as something of a shock to see him going for a photographer earlier this year. "You've got to have some respect!," whimpers the Coldplay singer in as threatening a tone as he can muster, before heading off home to have a good cry and write a plaintive piano ballad about the experience. It would probably be quicker to count the number of people who don't want to punch the Jamiroquai singer in the face than those who do, so the chances are that you'll enjoy watching as a photographer fells the one-trick funkster with a brutal headbutt. The video tells the back story, but if you want to skip straight to the violence, it all kicks off at 3:30. Bjork has always been slightly bonkers, but it still came as something of a surprise to see her giving a reporter a good shoeing as she left Bangkok airport. Note how she tries to go back for more even as she's being led away - that's a killer instinct if ever we saw it. No list of scuffling rockers would be complete without the unreconstructed Oasis frontman, so let's take a look at him brawling with a photographer. The footage forms part of a news report in which the anchor embarrasses himself twice: firstly, by attempting to lead into the story with a 'Don't Look Back In Anger' pun; and secondly for failing to recognise that Liam didn't even sing that song.